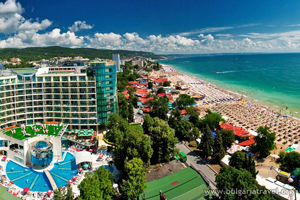 Golden Sands is the perfect destination for a day trip from Varna. The resort is also a good starting point for sight seeing. Nearby you can find: Fortress Kaliakra, Lake Dourankoulak, Mussel farm and "the rock capital of Bulgaria " - Kavarna. You can also use Varna as a starting point for your journey to the northern coast. The city is located close to: Kavarna, Balchik, Albena, Kranevo, St. Constantine and Helena and Kamchiya. 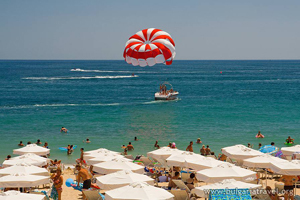 The resort Golden Sands is a beautiful and big seaside resort in northeastern Bulgaria. Located only 18km from the Varna and it is situated near a National Park. The name of Golden Sands comes from an ancient legend that place represented once upon a time a hideout for pirate booty. The Nature, however, did not like such a sacrilege, so she turned all their gold into sand. Golden Sands offers a wide range of hotels for accommodation. The resort is the proud owner of several five star hotels - Oasis, Imperial, Admiral, Marina and Riviera Beach. It also has many other hotels, each with bouquet of a unique set of services to impress the customers. There are a few residential complexes, in the resort where you can buy or rent an apartment. The natural scenery that surrounds the resort and the services offered by its hotels, make it one of the most popular summer resorts, which, however, does not remain empty in the winter. During the snow season in Golden Sands many corporate events such as seminars, workshops, trainings, workshops take place. The famous rock monastery “Aladja Manastir” is located in the park next to Golden Sands and therefore it can be reached both on foot from the resort and by car. 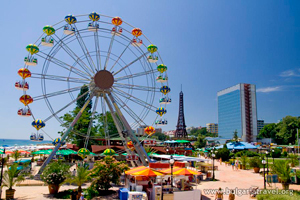 Varna should not be neglected too: Varna has a lovely park – the Sea Garden, which hosts attractions such as the Aquarium, Dolphinarium and Zoo. Visitors of the resort can consider day trips to any of the locations listed below. the Stone Forest “Pobiti Kamuni” is an unique rock formation, which was once probably a bottom of the sea and it is only 3 kmBalchik, on the other hand is a small town known for its Palace and botanical gardens, home to many rare plants. Balchik, on the other hand is a small town known for its Palace and botanical gardens, home to many rare plants. Near Balchik is Kavarna - the so-called rock capital of Bulgaria, which hosts annually Kavarna Rock Festival. Near the rock capital is Kaliakra – a fortress dating for centuries ago. Another interesting historical site is the ancient Bulgarian capital Pliska. Pliska is not more than 80 km from Varna and it is connected to the city by highway. Only 8 km from Pliska is the Madara Horseman - a rock engraving protected by UNESCO dating from ancient times. Very close to it is an ancient Fortress – The Shumen Fortress. The resort Golden Sands certainly “knows” how to satisfy its tourists. Some hotels use its mineral springs and offer a variety of spa treatments. The tourists have at their disposal 10 tennis courts, horse riding opportunities, basketball and volleyball courts, a bowling alley, fitness centers, aqua park, safari hunting parties, paintball tournaments and much, much more. Golden Sands also offers a mini golf, where players could warm up for the wonderful and great golf courses located only 45 km from Varna. The resort also offers all kinds of water sports. Experts can immediately rent all the necessary equipment and embark on adventures, and for the beginners there are courses in scuba diving, yacht management, surfing, sky - diving and more. Nightlife in Golden Sands is very attractive and certainly every client’s taste can be easily satisfied. The resort has many clubs, bars and casinos with different entertainment programs. The Information Center in Golden Sands each year prepares a summer program including concerts, plays, shows, live performances and so on. The center also organizes exhibitions, Bulgarian language courses, beer festivals, a parade of vintage cars, as well as many interesting events that change every year. The Program is unique each year. Of course, each hotel has its own entertainment program for its guest, that is developed by specifically employed for the purpose animators.